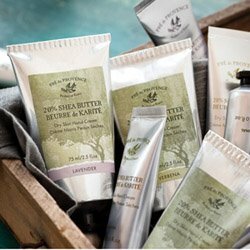 Shea Butter soaps, lotions, creams and shave soaps from Pre de Provence | P.C. Fallon Co.
One of nature's most effective moisturizers, Shea Butter is ultra rich yet gentle, providing emollient moisture, protection and healing for dry skin, hair, cuticles and lips. Pre de Provence makes dozens of wonderfully soothing and effective bath and body products enriched with generous amounts of Shea Butter. All made in France. In central Africa, the karite tree flourishes amid harsh, arid conditions. Sometimes called the "tree of life" for its many beneficial uses, the karite tree produces a nut containing the natural fat shea butter (butyrospermum parkii). This rich, gentle emollient butter is a key ingredient in many of Pre de Provence's most popular bath and body products. Note that hard-to-find 100% Shea Butter is also available. All Pre de Provence bath and body products are made in France.